Furniture, functional objects and interior elements for the new age - from Detroit. SHAPE Preview Exhibition at the Shinola Flagship Store for Detroit Month of Design 2018. Featuring Works by George Nelson, DuBois Collection and Colin Tury. Photo x Michelle and Chris Gerard. As part of Detroit's Month of Design, NEXT:SPACE + TOM GIBBS STUDIO introduced SHAPE: Defining Furniture in Michigan's Design Legacy, an exhibition and design talk series exploring the past, present and future of furniture design in Michigan and Detroit. Setting the precedent for furniture design innovation in the mid-20th century, these practices put Michigan on the map as an incubator for important furniture. In identifying these themes SHAPE helps us realize how Michigan designers, specifically those in Detroit, are carrying on the legacy of important furniture design today and what this means for the future. SHAPE debuts these themes for the Detroit Month of Design with a special pop-up Preview Exhibition at the Shinola Canfield Flagship Store, September 7-30th - further exploring each theme with its own exhibition. The entire six-part series runs through February 2019 at TOM GIBBS STUDIO. 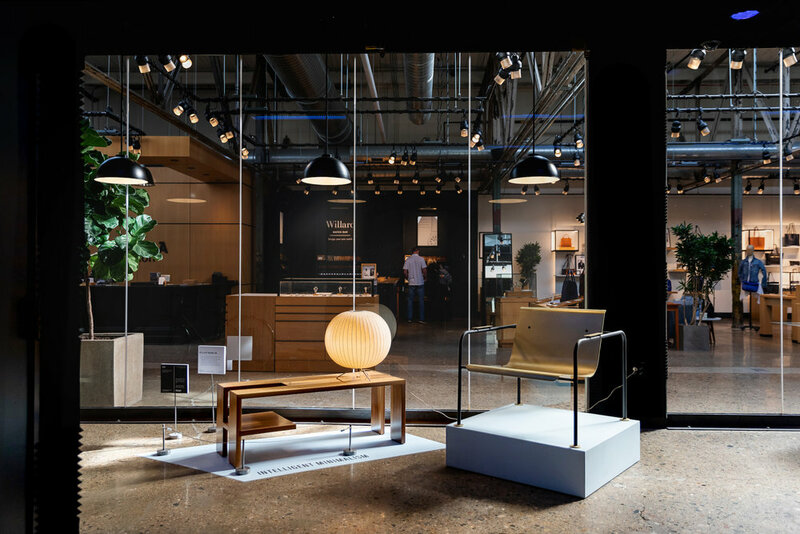 NEXT:SPACE+TOM GIBBS STUDIO are pleased to partner with the Shinola Canfield Flagship Store to present the SHAPE Preview Exhibition and with Detroitistit as the supporting media partner. SHAPE: Defining furniture in Michigan's design legacy is part of the Michigan Design Icons series produced by NEXT:SPACE and TOM GIBBS STUDIO. In the 21st century, ‘minimalism’ has become part of our daily lexicon and, yet, the philosophies behind it are often overlooked. The practice of ‘Intelligent Minimalism’ examines the thought and purpose of minimalist design, whether the focus be on material, form or the subtle interaction of a design object with the environment beyond. Taken from the moniker Florence Knoll gave her clean, modernist designs. This practice references the importance of thoughtfully designed and crafted staples that balance statement furniture within interiors while also examining how we view ‘staples’ in the contemporary design world. Technology and design are inextricably linked. The processes used to make things evolves over time and often the aesthetics of design are dictated by the technology used to create them. This practice examines the relationship between technology and design innovation throughout the 20th and 21st centuries. The invention of new materials in the 20th century, such as Fiberglass and plastics, opened up an entirely new world to designers - spurring experimentation not only with new materials but also with materials previously overlooked in furniture making. The practice of material experimentation is ever expanding with contemporary studio designers finding new and innovative uses of materials old and new, natural and man-made. Mid-century modern design is marked by a shifting of forms. Evolving the traditional notion of how ‘tables’ and ‘chairs’ should and can look to fulfill their function, designers experimented with new and unusual shapes to create forward thinking design- a practice carried on today by contemporary designers. “Layering Transparency” Table Top Objects by Nina Cho. Price Upon Request. Proud partner of the Detroit Month of Design 2018. Gallery + Office Hours: THURS-SAT 12-6P & By Appt.